Since veneers are individually sculpted for each patient, it is nearly impossible to tell the difference between a veneer and a natural tooth. Unlike natural teeth, custom-made veneers resist coffee and tea stains, and cigarette smoke because they are made of high-tech ceramic materials. With veneers—as opposed to crowns—your natural teeth remain largely intact with only a minimal amount being altered to fit the veneer. 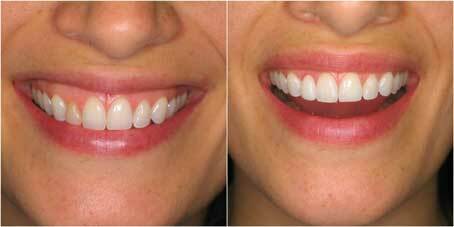 For teeth that resist whitening, veneers can make even the darkest teeth appear bright white. Some patients are looking for an alternative to traditional dental veneers or bonding, but be aware that this treatment option is not appropriate for everyone. Just as with porcelain veneers, “no-prep” or minimal preparation veneers— so called because they typically don’t require the dentist to remove as much tooth material—are bonded to the front surface of your teeth. 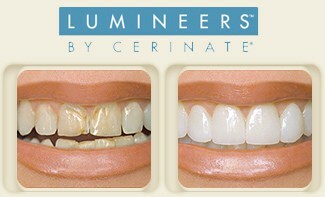 Often, the placement of no-prep veneers can be done more quickly and with less discomfort than traditional veneers. The Affordable, non-invasive, completely reversible cosmetic removable arch that can easily and painlessly give you that beautiful smile. For: Gaps, crooked, stained or missing teeth • Those who are not candidates for bridges or implants • Anyone who would like a Hollywood smile without the expense and discomfort of complex and invasive dental procedures, a preview of more permanent options • Anyone who has an old-fashioned removable partial denture and wants a beautiful, more comfortable alternative.